What To Do When Your Texas Fiberglass Pool Needs Crack Repair? There are few things better on a hot day than jumping into your backyard Fiberglass Swimming Pool. Chances are, your pool is the focal point of your outdoor entertaining, whether it’s having a few people over for drinks on the Poolside Patio or you’re throwing a big bash. Even if no one is swimming, water has a calming effect and can make you feel relaxed and happy just by sitting near it. But what happens when your pool starts showing symptoms of aging or neglect? Unattractive Pool Cracks, stains and blisters can be a sign of an active pool leak or a warning of a problem that’s to come. Either way, a pool crack can’t be ignored for long. People love fiberglass pools for their low maintenance, but that doesn’t mean you can disregard your pool altogether. Fiberglass pools have a lifespan of 20 to 40 years with few needed repairs, but things can and do go wrong. Only an experienced fiberglass pool repair specialist knows how to handle a pool crack repair without destroying the shell during the process. When your home or commercial pool needs a Pool Crack Repair, it’s important to call an experienced Fiberglass Pool Repair technician for the job. Find peace of mind with your pool! Texas Fiberglass Pools Inc. truly believes that every pool owner, commercial or residential, has the right to an exquisite-looking swimming pool or hot tub, made with quality materials. We have a long history fixing and resurfacing pools for our Dallas-Fort Worth area customers. Happiness and relaxation should result from beautiful pools and hot tubs. To ensure that your pool that will last for decades, regular pool repair and maintenance is required. Sun damage and wear and tear make some repairs inevitable, but there are thousands of other problems that could spring up and ruin your pool. Texas Fiberglass Pools Inc. Pool Repair technicians excel in providing outstanding service for any problem or task. Our experts understand problems, can identify solutions and carry the right products to keep your pool running properly and looking spectacular. We don’t stop there. We can create an oasis with custom rock waterfalls and stunning flagstone walkways and patios. We even build and re-finish baptisteries! From your personal basin to a calming cascade, what we’re trying to say is that we’re passionate about pools! 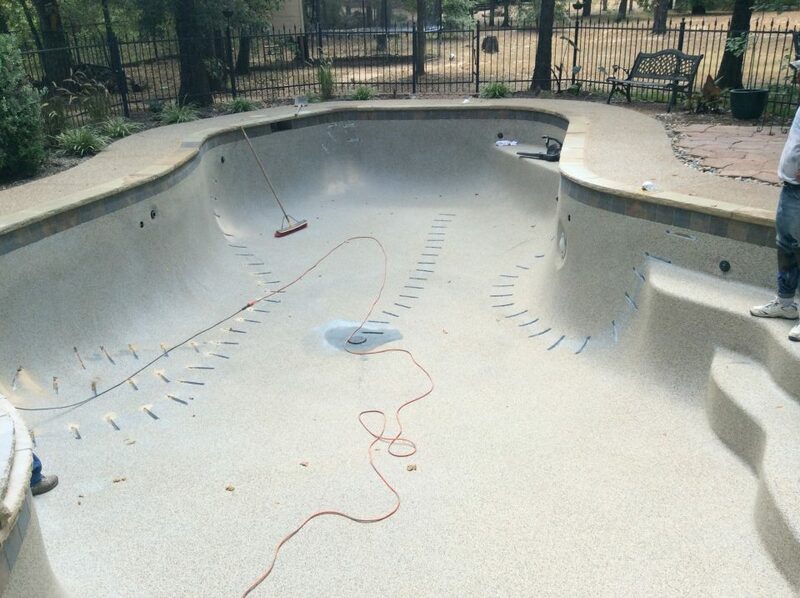 Texas Fiberglass Pools Inc. can evaluate the issues you are having with your existing fiberglass pool and figure out the best available solutions for your situation. Our free evaluation and estimate will educate you about the option that makes the most sense for you. Soil movement around the pool, aging plumbing connections, pool equipment issues and cracks in the fiberglass can all result in pool leaks. Most water loss, however, can be traced to leakage somewhere on the system’s suction or return lines. Stress cracks are often called spider cracks because they will radiate in numerous directions and look like a spider’s web. These hairline cracks occur in the surface layer of the gel coat of any fiberglass product and are a result of point-pressure on the shell that exceeds the gel coat’s ability to flex. They are not structural in nature, as the crack is normally only through the thin layer of gel coat and do not extend into the structural laminate layers of the pool. These cracks are usually the result of rough handling while loading or unloading, or a twist in the fiberglass shell by a poor installation. Raised bumps on the walls and bottom of a shell are caused by the hydrolysis of the gel coat’s polyester resin and laminate. As time goes on, the blisters can break from internal pressure and form a pinhole or a crack in the exterior surface. This rupture allows the blister fluid to rapidly leak out and ground water to flow into the laminate much faster. New blisters form at a deeper level, eventually rupturing and the process continues. Discoloration is often related to water chemistry issues or poor maintenance. Higher concentrations of chlorine in one area, such as coming out of a return jet, are often to blame. Fading, however, is a natural phenomenon and if it’s bad enough, sometimes a resurfacing is done for aesthetic reasons. Is Your Pool Leaking Water? Call Texas Fiberglass Pools Inc.
It’s only natural that your pool will lose some water to due to evaporation, splash out and backwash, and gain some from rainfall. So how do you know if your pool is actually leaking water? Does a pool crack always mean a major pool repair? A good rule of thumb is that if you’re routinely adding more than two inches of water to your pool every week, you probably have a leak that is worth spending some time and money to repair. In many instances, however, a simple patch to the offending area may be all that is required, saving you downtime and money. Texas Fiberglass Pools Inc.‘ team of Texas Pool Repair Professionals are equipped with the widest range of expertise that guarantees no pool repair, waterfall installment or patio job is a match for our skills! We have yet to meet a pool repair, renovation, remodeling or upgrade we couldn’t handle. If your residential or commercial pool needs help, look no further than the professionals at Texas Fiberglass Pools Inc.. We will fix your leak and make your entire pool area look like new again. Texas Fiberglass Pools Inc. can bring your fiberglass pool, spa, fountain and patio back to life no matter what condition they are in. From Pool Crack Repairs for aesthetic reasons, damage prevention or active leaks, we are the Pool Repair experts in Texas. We also offer pool leak protection, detection, and repair. When a leak or crack in your pool happens, we can be immediately correct it. If we find a crack or leak, all seams of your pool can be sealed and protected using high-quality products and materials that will seal and prevent leaks from occurring again. This extends the life of your swimming pool or hot tub throughout years of use. At Texas Fiberglass Pools Inc. we only use the most reliable and high quality materials for any of our repairs and renovations for our Texas and Surrounding States customers. No matter what kind of pool crack repair you need, fiberglass is the restoration material of choice. Since Fiberglass is smooth and non-porous, it absorbs fewer chemicals and organic material, and resists algae stains, too. The main ingredient, silica, is an abundant, natural, non-depleting resource, which also makes fiberglass the greener alternative for Pool Crack Repair. There are different materials people use to line modern day pools, but we can assure you that fiberglass is the most durable, affordable, and easiest to install and maintain. People assume concrete with a plaster liner are enough; but they stress and crack over time as they expand and contract with the seasons. You might need to resurface a pool like that every 10 years. But fiberglass pools maintain their shape in any condition, and they require much less maintenance that last decades without ever needing a full resurfacing! We offer a variety of colors for your fiberglass surface: white, light blue, blue, medium blue, and blue-green. Our fiberglass surfaces will bring sparkle and splendor to your homestead or commercial business for generations. When you suspect you might need a pool crack repair, contact Texas Fiberglass Pools Inc. for a free pool inspection and estimate.